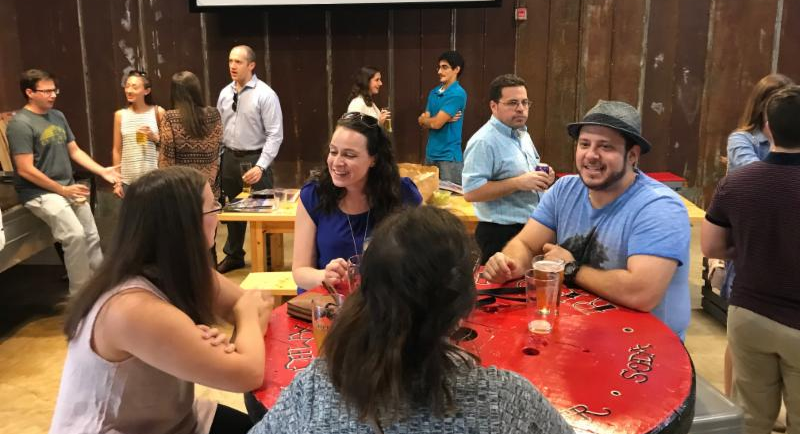 Photo is from a recent You Belong In Birmingham event where about 40 young professionals gathered at a local brewery. As our local Jewish community and the Jewish world in general continue to evolve, we believe it’s important to articulate the importance of having a strong Jewish Federation and to highlight the impact that our Birmingham Jewish Federation has locally, nationally and globally. It is as a result of donors contributing generously to our BJF Annual Campaign, that we are able to do the things highlighted here in addition to other important endeavors. The Birmingham Jewish Federation is the Jewish community’s central fundraising organization. We are the single largest funder of Collat Jewish Family Services, N.E. Miles Jewish Day School and the Levite Jewish Community Center. Additionally, we raise funds for other agencies that assist the Jewish community locally, nationally and globally. We also have our own programming that enhances the Jewish community around us. You Belong In Birmingham serves over 200 young Jewish professionals every year. We also have created many leadership opportunities for young Jewish adults in our community and even raised additional funds for a large group of young Jewish leaders to experience Israel together. Our PJ Library project engages young families with at least one Jewish parent by sending them free books with Jewish content for children six months to eight years old. We reach about 200 families annually. On our college campuses, our Federation supports Jewish student life at Alabama, Auburn, Birmingham-Southern and UAB, as well as fostering an environment on those campuses that is supportive of Israel. In addition, our Federation helped lead a coalition of statewide groups that successfully encouraged the Alabama Legislature to pass one of the strongest anti-Boycott, Divestment and Sanctions laws in the country. This law, in effect, bars the state of Alabama from doing business with companies that boycott Israel. Locally, nationally and globally the Federation is part of a network that monitors and combats anti-Semitism. At the same time, our Federation has been at the forefront of initiating dialogue programs locally with leaders from the Latino, African-American, Christian and Muslim communities to enhance understanding among these varied groups. In times of crisis, dollars from the BJF have gone to rescue Jews from Ethiopia, Yemen, the former Soviet Union, France, Venezuela and even Iran. Our funding provides for transportation to Israel and support for these new immigrants to enter the mainstream of Israeli society. Our dollars go beyond just helping Jews. Two of our largest campaign beneficiaries –Collat Jewish Family Services and Levite Jewish Community Center — have a substantial number of users who aren’t Jewish. In Israel, we fund programs that benefit Israeli Christians and Israeli Muslims in addition to Israeli Jews. We also help provide protective shelters to those in Israel who sometimes just have 15 seconds to find a safe place after a rocket siren goes off. One of those shelters we have provided is housed next to an elementary school. The kindergartners, who were in a separate building from the rest of the school, now do not have to run as far to find shelter. We are proud of what we do — locally, nationally and globally. We also have helped pioneer a new collaborative arrangement with our LJCC — sharing an Executive Director and other staff — which has saved our community considerable money and helped open the door to reimagining our Jewish community as we head into the future. Through the Birmingham Jewish Federation, you can have the satisfaction of knowing that your single contribution makes an impact on the lives of thousands of people everyday who benefit from the network of services that we provide as we strengthen Jewish life and benefit others at home and abroad. As always, we thank all of you who support the BJF. Click to contribute to the BJF’s Annual Campaign.